Place sugar, cinnamon and orange juice in saucepan. Stir over at low heat, until the sugar has dissolved. Bring to the boil and boil for 2 – 3 minutes. Blend the orange flesh in a liquidizer until smooth. Stir the sauce into the syrup. Pour the mixture into a container suitable for the freezer. Freeze until set, stirring occasionally. 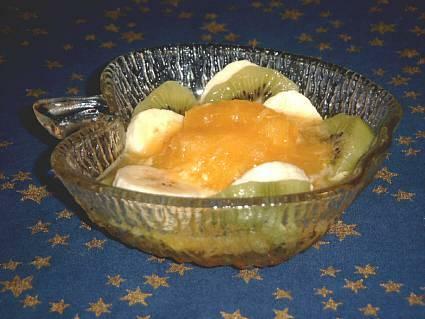 Serve scoops of the sorbet with fresh fruit (grapes, bananas, melon...).